A new gardening project in Senegal is addressing issues of food security, poverty and climate change. Super Vegetable Gardens are hoping to help small-scale farmers throughout Senegal and in tropical areas around the world. Seventy kilometers northeast of Senegal’s capital, Dakar, is a long stretch of highway dotted with sprawling baobab trees, leading close to Keur Madaro village. Here, under the prickling African sun and on a land that is mostly dry and dusty, ten vegetable gardens overflow with green leafy vegetables. Last June, a new agricultural initiative known as super vegetable gardens was introduced in Senegal. Nearly a year later, there are more than 150 such gardens throughout the country. It is the result of 30 years of research that was first field tested in Niger in 2007, as a collaboration between the international aid group Pro-Natura and the French firm JTS Seeds. “It is very, very new. The only obstacle is linked to the type of person taking care of the garden. It works exceedingly well technically, but you have to spend two hours per day to feed a family of ten people,” says Guy Reinaud, president of Pro-Natura. Each 60-square-meter garden starts with a single kit – something of a toolbox for farmers. Inside is a selection of organic, non-genetically-modified seeds for fruits and vegetables including cabbage, tomatoes, carrots and melons. The kit also includes soil conditioners, such as fertilizers, and growing equipment, like plastic veils to protect the plants. Francois Sarr started his first super vegetable garden in October. He says his first harvest weighed nearly 200 kilograms. After feeding his family of seven, he was able to sell the rest of his cucumbers, beets and eggplants at the local market. He made a profit of more than $150. For most farmers, stories of this kind seem too good to be true. Like much of Africa, farming in Senegal forms the backbone of the economy, employing more than 70 percent of the population. Farmers, like Sarr, have been particularly affected by climate change. Rises in temperature and erratic rainfalls have lowered crop productivity. Agricultural development officials say food insecurity and malnutrition in Senegal is widespread, with more than 60 percent of people not eating enough calories every day. Even if food could be distributed, there just simply is not enough to go around. Moda Gueye, who directs programs for JTS Seeds in Senegal, says it is great to talk about food quality, but that there are still people dying from hunger in Senegal. He says people now can produce more food than under traditional means, and can make it better quality. It was developed more than 7,000 years ago in the Amazonian rain forest, under its local Brazilian name, Terra Preta. It is used as a powerful soil conditioner and, among agriculturalists and academics, biochar is the hot new topic. Biochar has the potential to increase crop productivity, reduce water consumption and even act as carbon sinks to absorb and store CO2 from the atmosphere. In Africa particularly, where wood is still the main energy source, alternate fuel supplies must be made available. Biochar could help solve this problem, but for the next year it is still in its testing phase. “There is very little money for innovation, and we are in innovation. It is totally new. And, it is only last year that we have been helping JTS Semences to move into Senegal, Algeria, Egypt and now into Haiti and Brazil,” said Pro-Natura’s Guy Reinaud. But, without better access to information on climate and to new crop technologies and techniques, many farmers are left with few options. Among the Senegalese young people, in particular, it is difficult to encourage agriculture as a viable means of employment. Gueye says a country where, in 10 to 15 years, no one grows anything will be a catastrophe on an economic and social level. In the villages, the kids tell me they would rather get on a boat to flee to Europe. They tell me here they are already dead, because here they have nothing. 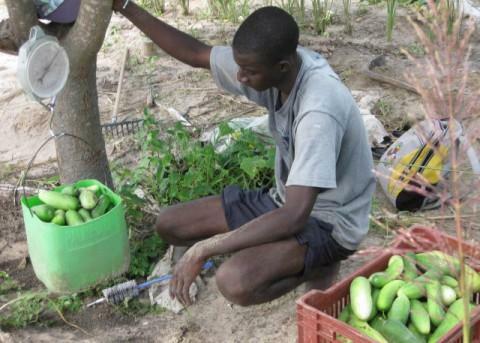 Article is available at: http://www1.voanews.com/english/news/africa/Senegalese-Farmers-Using-Innovative-Garden-Project-to-Boost-Productivity-91723244.html.